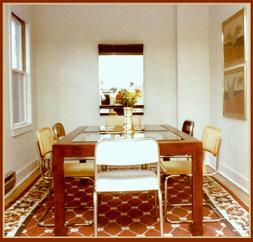 First Boston apartment, 1987; Baker 1800 Series chairs by Brian Palmer, Mies "Cesca" chair copies, John Saladino "Facade" mirror for Baker, and a Baker "Collector's Edition" dining table. The notion of a "MassModern Gallery" had many years to germinate. 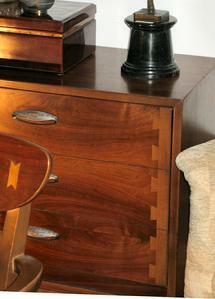 It may have originated as early as 1984, while working at the Baker Furniture Company factory in Holland, Michigan. Or perhaps it's developed over twenty five years of subsequent scavenging, including so fortunately at so many of these original factories, in what had to be the most fertile fields imaginable. A personal collection developed, with little more curatorial theme than that of "premium American mid-century production furniture." Long ago had disappeared any extra space into which something extraordinary could be added. Finding a nearby "Gallery space" would solve several problems at once. In 2007, MassModern was formalized, in a space that has become a little bit office, a lot photo studio and workshop, part warehouse, and on its best days a humble and warm exhibition space. In the Spring of 2008, our opening show was dedicated to great 20th Century Architects and their contributions to the "mass produced " American furniture lexicon. "Architect Modern / 1929 - 1985" focused on architects who played the role of "name designer" to new American furniture collections, much as do Barbara Barry or Bill Sofield today. As part of this show, our study particularly of Eliel Saarinen's "Flexible Home Arrangements" in 1939 for Johnson, and of Frank Lloyd Wright's "Taliesin Ensemble" for Heritage Henredon in 1955 became more formalized, resulting in the first MassModern "Collector's Study Guides." 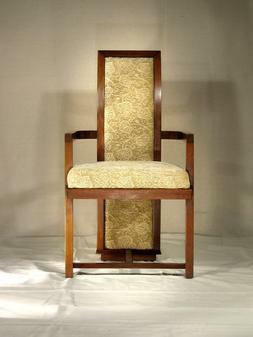 Frank Lloyd Wright "Taliesin" Chair, 1955. In 2008 and into 2009, we presented an exhibition of "Designer Modern" furniture, with particular emphasis on the work of T. H. Robsjohn-Gibbings for Widdicomb in the 1950's. In late 2009 we completed our third special exhibit, focused on the "Acclaim Collection" by Andre Bus, 1959. With over 45 total items shown from that collection, in a "bricks and mortar" sense, this was the largest MassModern show to date. In a "virtual" sense,MassModern is an avenue for dialog and information exchange. Our exhibitions are well focused, and the items we research, exhibit, and offer for sale are typically presented with extensive historical background both of of the item itself, as well as also often of the personalities involved in that items development.We work hard to include photographs that, while occasionally inelegant, are at minimum fairly documentary. At least that is our intention. Our Gallery Director enjoys a twenty five year career in the home furnishings industry, including senior marketing positions with Baker Furniture, The Kittinger Company, Thayer Coggin and Widdicomb/Bexley Heath. We’ve developed extensive research resources in these and several additional categories, and an important part of the MassModern mission is to share this information.